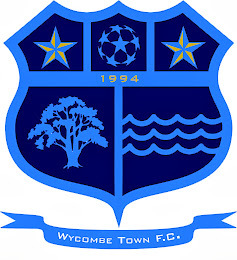 Wycombe Town FC: WIN FOR 'TOWN' ! In wet, windy, miserably cold and muddy conditions, ‘Town’ visited Ferny Fields at Booker to play King George V in a Premier division game. Kicking into the wind, ‘Town’ went on the attack restricting ‘King George’ to random counter attacks which the ‘Town’ defence handled well. After pressurising the ‘King George’ defence ‘Town’ got a break which James Hall capitalised on and slotted the ball into the net to make the score 1-0 at half time. Amazingly able to play some passing football in the bad conditions, ‘Town’ found themselves 3-0 up after Allison Batista drove the ball into the net and then Michael Butcher neatly chipped the keeper. ‘Town’ then let the lead slip with two soft goals and a superb shot and the score was even at 3-3. Making two late substitutions ‘Town’ went for the winner and pressurised the ‘King George’ goal mouth and substitute Craig Mant in only his second outing after injury in 10 months, latched on to a great through ball from Batista and drove the ball home, for ‘Town’ to claim all three points winning 4-3. New Blue White and Brown kit!! !